As mentioned in Part 3, creating planting plans using Areas has certain drawbacks. The most substantial is that Areas do not have types, so their parameters are all instance parameters. This can be mostly overcome by using Styles. While Styles have their own rules, they make it easier to tie Area parameters together, which can also make it easier to define perennial plant mixes within a single Area. Styles can be used across all scheduleable families/ categories and are accessed by creating a schedule key instead of scheduling building components (when creating a new schedule). After creating an Area Style schedule, the only existing/ provided parameters are Key Style, Name, and Comments. More parameters can be added, but these cannot be shared parameters, which means that they cannot be tagged. This is slightly annoying, especially since Key Name is also not a taggable parameter. But you can still tie most of the parameters together. This is what my Area style schedule looks like after adding parameters and several rows of Styles. Now, these new parameters and Area Styles must be brought into the main schedule. If (like me) you have already built your schedule with shared parameters, this means reworking it slightly to replace parameters fields and calculated value fields. The one shared parameter that I do keep is the Key, which I use as the plant species identifier in the Tag. As you can see, I use my typical Key naming convention for the Area Style (Key Name), but they do not need to be the same. The only thing I do not like about using Area Styles is that the style parameters are “locked” (no longer editable) in the overall planting schedule. You must go back into the Area Style schedule to edit them. For some people this may be beneficial, however I am used to managing all of the parameters from within the main schedule. In general, plant mixes are tricky since they involve multiple plants within the same area. Revit does not allow Areas to overlap at all, so I typically create a Plant Mix as a single Area that has parameters for each plant type within the mix. Here is the same Area Style schedule, now with a few more parameters and some plant mixes (at the bottom). While plant mixes can be used independently of Styles, with so many additional parameters to maintain, using Styles is probably the way to go. Using the Mix Type parameters, I created a simple schedule to pull counts for each type within the mix. Here is the main planting schedule and the plant mix schedule. As you can see, the schedules and tag have a few gaps to be filled in. Per request, I am posting this Revit project file for download. You can take a look at all of the areas, schedules, and tags that are in there, and even finish them out. 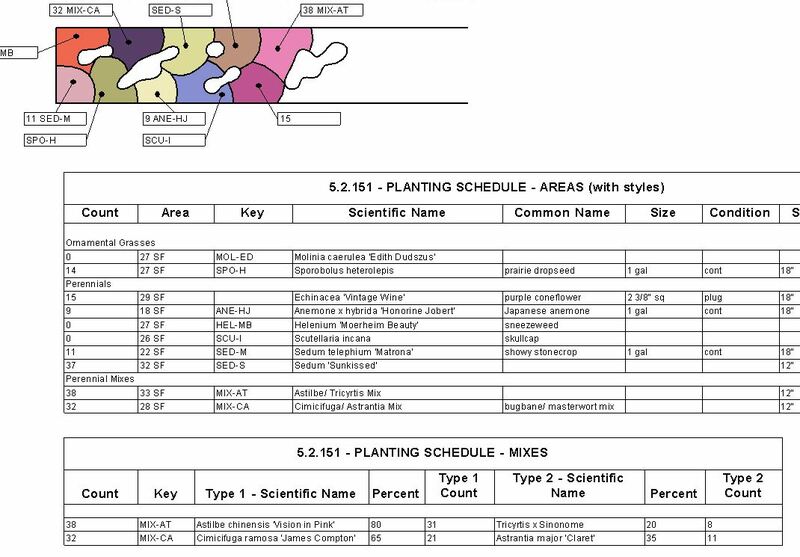 This planting plan is based on a plan sketch that Piet Oudolf did for the New York Botanical Garden (the image is still in there, for reference). Key schedules get interesting with linked files. When you schedule and include items from the linked file, it copies over the key schedule, but this has no link to the original.